HUNTINGTON, W.Va. – Tim Cramsey, Marshall's first-year offensive coordinator, played at New Hampshire and coached there from 2003-2011. He has seen how a team from the Football Championship Subdivision can perform when it receives a shot at one of the big boys. During Cramsey's stint as an assistant at New Hampshire, his teams pulled off wins against FBS programs Rutgers (2004), Northwestern (2006), Marshall (2007), Army (2008) and Ball State (2009). That's five wins in a row for an FCS team vs. FBS competition. This Saturday, at 6:30 p.m. (ESPN+ broadcast), Marshall (1-0) hosts Eastern Kentucky (1-0), an FCS team from nearby Richmond, Kentucky. Although nationally ranked South Carolina awaits the Thundering Herd next weekend, there is no way Marshall will overlook a team in its regular season home opener. "When you watch them on tape … they have two defensive ends who can play for anybody, they had five sacks against Kentucky a year ago and had a chance to beat Kentucky on the road," Marshall coach Doc Holliday said. "Nobody needs to think this team is going to come in here and can't play, because they can." In college football's opening weekend, several FBS programs were knocked off by FCS teams. UC Davis defeated San Jose State, Villanova beat Temple, North Carolina A&T knocked off East Carolina and Northern Arizona routed UTEP. EKU has fared well against FBS competition in recent seasons. In 2014, the Colonels beat Miami (Ohio). There were close losses to Indiana (19-13) in 2009, Louisville (23-13) in 2010, Kansas State (10-7) in 2011 and Kentucky in overtime in 2015. Last season, EKU opened its season with losses to Western Kentucky, 31-17, and Kentucky, 27-16, so neither FBS team routed the Colonels like some might anticipate the Herd doing this weekend. "Somebody is going to get beat (this weekend) that shouldn't," Holliday said. "It happens … we have to make sure it's not us." Eastern Kentucky and Marshall have a long football history that dates to 1926. Marshall leads the all-time series 10-8-1, the last meeting coming in Huntington in 1992. The programs claimed a combined four national championships – two each – from 1979 to 1996, when the Herd ascended to FBS (then Division I-A) status. EKU is also a footnote in Marshall's storied history. The Colonels visited Huntington on Nov. 10, 1990, in the final game at Fairfield Stadium. A crowd of 16,517 watched Marshall build a 12-0 lead against a No. 1-ranked EKU team, but squander that lead in the fourth quarter and lose, 15-12. A newspaper headline read "Marshall seeks make-or-break victory over #1 team" prior to the game, as the Herd had struggled to a 5-4 record and No. 18 ranking nationally, so playoff hopes were in the balance. Through three quarters, the top-ranked Colonels generated 71 yards of offense and hadn't moved past the MU 40-yard line as the Herd defense put together a streak of nine consecutive quarters without allowing a point. Two touchdowns in the final 10 minutes kept EKU's perfect record intact, and sent Marshall into its new football home with a loss. Marshall senior receiver Tyre Brady began his final college season with a bang at Miami (Ohio) last Saturday: nine receptions, 116 yards and two touchdowns. It was his fourth 100-yard receiving game, but he is the first Herd pass catcher since Gator Hoskins (137 yards, two touchdowns) to have 100-plus receiving yards and multiple touchdown catches in a true road game. Tommy Shuler pulled off the feat three times, but prior to that the last Marshall receiver with 100-plus receiving yards and multiple touchdown catches in a true road game was Denero Marriott, who finished with 10 receptions for 179 yards and four touchdowns at Toledo in the 2001 Mid-American Conference championship game. Herd freshman quarterback Isaiah Green finished 24 for 37 passing for 272 yards and two touchdowns. Green completed 65 percent of his passes in his first collegiate start. The last MU quarterback with 250-plus passing yards, a completion percentage of 65 percent or better and multiple touchdown passes in the same game was another freshman, Chase Litton, who completed 68.8 percent of his passes with 486 yards and two touchdowns in a win at Charlotte on Oct. 31, 2015. 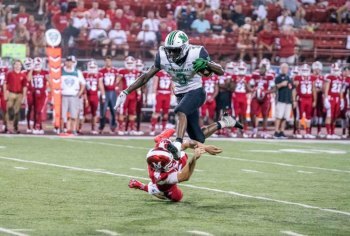 In the final 9:20 of Marshall's win at Miami (Ohio) last Saturday, electrifying sophomore running back Tyler King had all-purpose plays of 31 yards (kickoff return) and 50 yards (punt return). Overall, he finished with 17 touchdowns and two plays of 30-plus yards. Last season, King had 173 touches and three plays of 30-plus yards, which includes the 90-yard touchdown run in the Herd's Gildan New Mexico Bowl win against Colorado State. That tied a school record for the longest run and is the longest touchdown rush in school history. Holliday is going for an eighth consecutive win in a regular season home opener. He is 7-1 in those games in eight seasons at Marshall, the only loss coming in 2010 to West Virginia, 24-21, in overtime. Since then, Holliday's Herd have defeated Southern Miss (2011), Western Carolina (2012), Miami (2013), Rhode Island (2014), Purdue (2015), Morgan State (2016) and Miami (2017) in home openers. Marshall has won the last seven home openers by an average of 23.4 points per game.